Groovy 2.1 introduced the @DelegatesTo annotation. With this annotation we can document a method and tell which class is responsible for executing the code we pass into the method. If we use @TypeChecked or @CompileStatic then the static type checker of the compiler will use this information to check at compile-time if the code is correct. 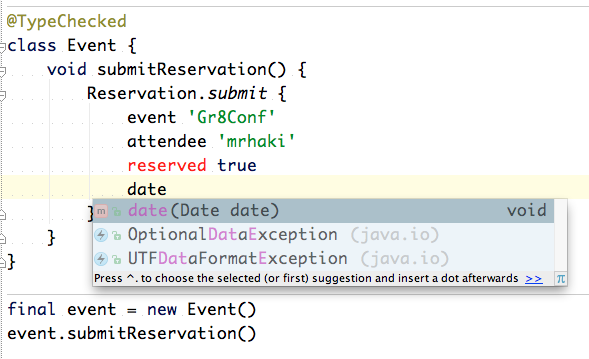 And finally this annotation allows an IDE to give extra support like code completion. Suppose we have the following class Reservation with the method submit(). The method accepts a closure with methods that need to be applied with the instance of the Reservation class. This is a very common pattern for writing simple DSLs in Groovy. * @param config Configuration for reservation, invoking method class on Reservation. [Static type checking] - Cannot find matching method Event#reserved(boolean). Please check if the declared type is right and if the method exists. Wow, this useful! We find errors in our DSL before the code is run. 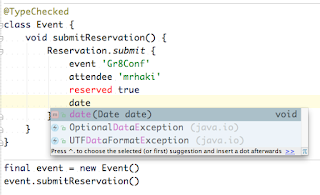 When we create this code in an IDE like IntelliJ IDEA we also get code completion in the Reservation.submit() method invocation in the Event class. The following screenshot shows code completion and a red font for reserved to indicate the compilation error.